Most voice teachers won’t teach kids younger than 12 or 13. Those teachers are certainly right in acknowledging the potential dangers of attempting to make children sound older than their age, or pushing their young voices too hard. However, there is still an abundance of useful things that children can learn in voice lessons without damaging their instruments. 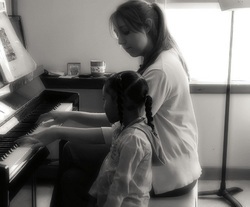 In voice lessons with children, I stick to one rule of thumb: everything we do in lessons should enhance the child’s future potential, not diminish it.